Hitherto wo have considered the leaf as foliage merely - constituted the fit organ of aeration by its large expansion of surface. This is indeed the chief, but not the only aspect in which it is to be viewed. 303. The leaf is a typical form, that is, the type or idea from which the Divine Architect derived the form of every other appendage of the plant. To trace out this idea in all the disguises under which it lurks is one of the first aims of the botanist. Several of these forms of disguise have already been noticed, e. g.
304. The scales which clothe the various forms of scale-stems are leaves, or more usually petioles, reduced and distorted, perhaps by the straitened circumstances of their underground growth. The scales of corms and rhizomas are mostly mere membranes, while those of the bulb are fleshy, serving as depositories of food for the future use of the plant. That these scales are leaves is evident, 1st, from their position at the nodes of the stem, 2d, from their occasional development into true leaves. 305. Bud scales. The brown scales which cover winter buds are of the same nature and origin. 306. The cotyledons of seeds or seed-lobes are readily recognized as leaves, especially when they arise above ground in germination, and form the first pair upon the young plant, as in the beech-nut and squash seed. Their deformity is due to the starchy deposits with which they are crammed for the nourishment of the embryo when germinating, and also to the way in which they are packed in the seed. 307. Phyllodia are certain leaf-forms, consisting of petioles excessively compressed, or expanded vertically into margins, while the true lamina is partly or entirely suppressed. Fine examples are seen in our greenhouse acacias from Australia. Their vertical or edgewise position readily distinguishes them from true leaves. Ascidia. 173. Nepenthes. 174, Sarracenia psittacina. 175. S. purpurea. 176, S. Gronovii. p. Drummondii. 177, Acacia heterophylla, its phyllodia. 308. Ascidia or pitchers, are surprising forms of leaves, expressly contrived, as if by art, for holding water. The pitchers of Sarracenia, whose several species are common in bogs North and South, are evidently formed by the blending of the involute margins of the broadly winged petioles, so as to form a complete vase. The broad expansion which appears at the top may be regarded as the lamina. 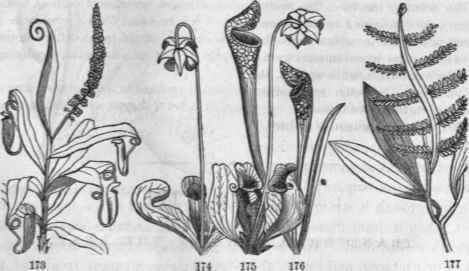 These pitchers contain water, in winch insects are drowned, being prevented from escaping by the deflexed hairs at the mouth. 309. Nepenthes. The greenhouse pitcher-plant is a native of the East Indies. Its proper leaves are sessile and lanceolate. The midvein extends beyond the apex like a tendril, to the length of six or eight inches. The extremity of this tendril is inflated into a hollow vessel, similar to a pitcher, and usually contains about half a pint of pure water. It is furnished with a leafy lid connected to it by a ligament which expands or contracts according to the state of the atmosphere, so that the cap is open in damp weather and closed in dry. 310. Dischidia. Another wonderful provision of this kind is observed in a plant growing in the forests of India, called Dischidia. It is a twining plant, ascending the tall trees to the distance of a hundred feet from its roots, and destitute of leaves except near its top. The pitchers seem formed of a leaf with its edges rolled inward and adherent, and its upper end or mouth is open to receive whatever moisture may descend into it. But the greatest marvel in its structure is that several bundles of absorbent fibres, resembling roots, are sent out from the nearest parts of the stem, enter the pitchers, and spread themselves through the cavity. 311. Air bladders. Many weak-stemmed water plants are furnished with little sacks filled with air to buoy them up near to the surface. Such are the bladders of the common bladderwort, formed from the leaf lobes. In the horned-bladderwort the floats are made of the six upper inflated petioles lying upon the surface of the water like a wheel-shaped raft, and sustaining the flower upon its own elevated stalk. 312. The leaf of Vencs' flt-trap (Dionaea), native of Carolina, is also of curious design. 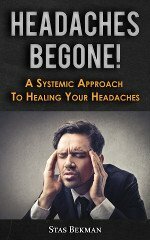 At the end of the leal" are two lobes bordered with spines. In the cavity between the lobes are several sharp points projecting upwards, and a gland which secretes a liquor attractive to insects. But when an unlucky fly, in search of food, alights upon it, the irritable lobes instantly close and impale him in their fatal embrace. 313. The Tendril is a threadlike coiling appendage furnished to certain weak-stemmed plants as their means of support in place. Its first growth is straight, and it remains so until it reaches some object, when it immediately coils itself about it, and thus acquires a firm, though elastic hold. This beautiful appendage is finely exemplified in the Cucurbitaceae and grape, above cited; also in many species of the pea tribe (Leguminosae), when it is appended to the leaves. It is not a new organ, but some old one transformed and adapted to a new purpose. In Gloriosa superba the midvein of the leaf is prolonged beyond the blade into a coiling tendril. In the pea, vetch, etc., the tendrils represent the attenuated leaf blades themselves. Again, the entire leaf sometimes becomes a tendril in Lathyrus, while the stipules act as leaves. 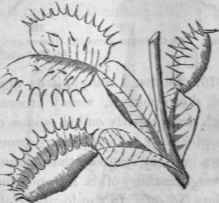 178, Leaves of Venus' fly-trap (Dionaea). 314. The petiole of the leaf of Clematis, otherwise unchanged, coils like a tendril for the support of the vine. In the greenbriar, the stipules are changed to tendrils, which thus arise in pairs from the base of the petioles. So probably in the gourd tribe. 315. But the tendrils of the grape-vine are of a different nature. 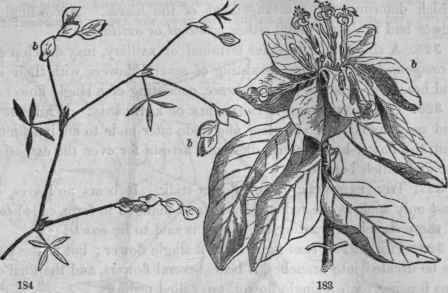 From their position opposite the leaves, and the tubercles occasionally seen upon them, representing flower buds, they are inferred to be abortive, or transformed flower-stalks. 182. Berberis, a, a, its thorns. 316. Spines. Many plants arc armed, as if for self-defense, with hard, sharp-pointed, woody processes, called spines or thorns. Those which are properly called spines originate from leaves. In Berberis the spines are evidently transformed leaves, as the same plant exhibits leaves in every stage of the metamorphosis. In goat's-thorn (Astragalus tragacanthus) of S. Europe, the petioles change to spines after the leaflets fall off. In the locust (Robinia), there is a pair of spines at the base of the petiole, in place of stipules. 317. Thorns originate from axillary buds, and are abortive branches. This is evident from their position in the hawthorn and Osage orange. The apple and pear tree in their wild state produce thorns, but by cultivation become thornless, that is, the axillary buds, through better tillage, develop branches instead of thorns. 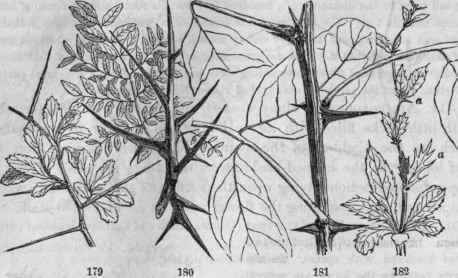 The terrible branching thorns of the honey-locust originate just above the axil, from accessory buds. 318. Prickles differ from either spines or thorns, growing from the epidermis upon stems or leaves, at no determinate point, and consisting of hardened cellular tissue, as in the rose, bramble. 319. Bracts. By a more gentle transformation, leaves pass into bracts, which are those smaller, reduced leaf-forms situated near and among the flowers. So gradual is the transition from leaves to bracts in the peony, e. g., that no absolute limits can be assigned. Equally gradual is the transition from bracts to sepals of the flower - affording a beautiful illustration of the doctrine of metamorphosis. (374.) Bracts will be further considered under the head of Inflorescence. Bracts 1S3, Pinckneya pubens; b, colored bracts (radiate sepals). 1S4, Zornia tetraphylla; b, bracts (enlarged stipules).